In the recent market sell off, some analysts wondered if the lack of corporate buybacks was a problem for the market. Buybacks have been a primary factor driving the bull market in the opinion of some analysts. That opinion is based on charts like the one below. 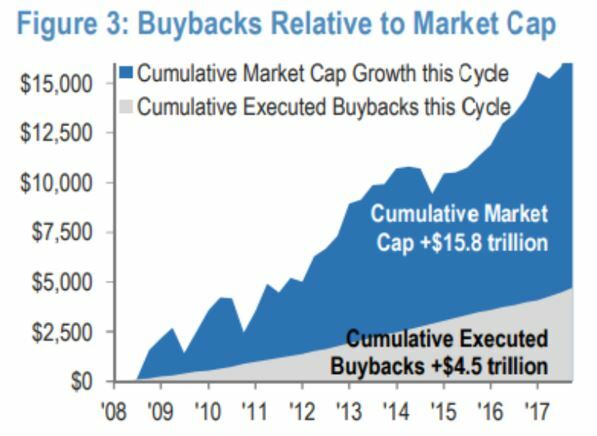 This chart shows that companies have bought back $4.5 trillion worth of stock and the belief is the buy backs drive prices higher. But, companies are not allowed to buy during earnings season. Many companies have put in place blackout periods that limit trading in shares from a few weeks before earnings are released until shortly after, sometimes just 48 hours after results are announced. Now, with about three quarters of companies releasing earnings, buy backs are expected to pick back up. That should support higher prices in the stock market. The view of analysts at JPMorgan is an example of the bullish argument. “With the largest one-way buyer returning in size to the market post earnings, we expect liquidity to improve and equities to move higher,” wrote equity strategists led by Dubravko Lakos-Bujas, in a research note, referring to buybacks. The report included the chart below which shows when companies are exiting their blackout periods. The report also noted that “…the latest selloff likely hastens the process as corporates should accelerate share repurchases post earnings. 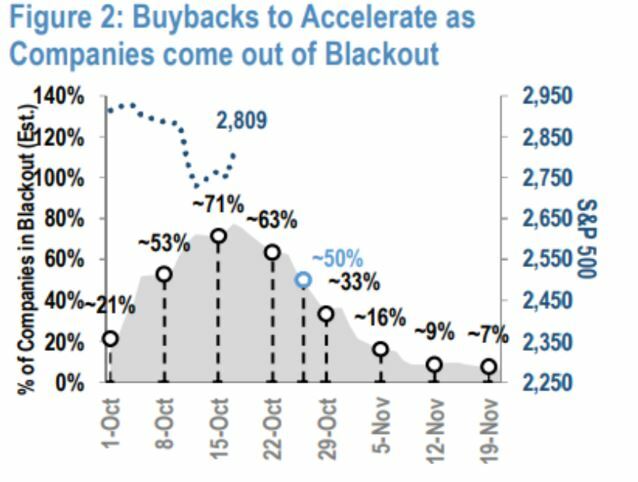 We believe companies best positioned to take advantage of the selloff are those with active buyback programs and coming out of the blackout period. Others agree with that view. 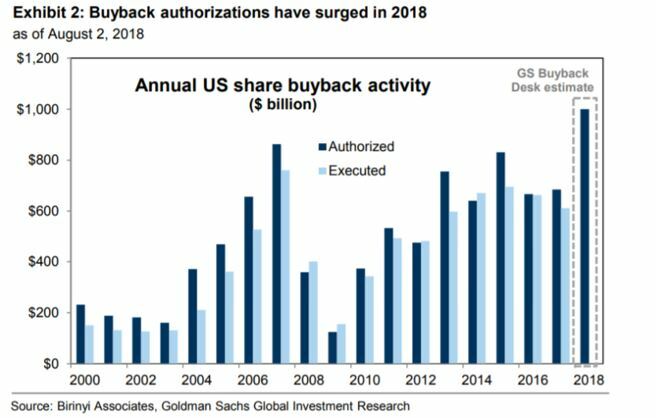 Analysts at Goldman Sachs project that stock repurchases will reach $1 trillion this year, up 46% from 2017 on the back of tax reform and strong corporate cash flows. “More than 80% of firms in the S&P 500 have reported results and may resume repurchasing stock on a discretionary basis after being on hiatus for the past month,” said David Kostin, chief U.S. equity strategist at Goldman Sachs, in a note released recently. Howard Silverblatt, senior index analyst at S&P Dow Jones Indices, also noted that buybacks are occurring at a more accelerated pace. “Buybacks are again running stronger than expected,” he said. Second-quarter repurchases are up 57% from the same period a year earlier, with notable activity in the tech sector where buybacks surged 130% year-over-year, according to Silverblatt. Going forward, buybacks are expected to play a critical role in supporting prices as big investors such as mutual funds and pension funds have been net sellers, Kostin said. The Goldman strategist maintains his year-end S&P 500 forecast of 2,850 which suggests that the market is largely expected to be rangebound until the end of the year although he projected a 12-month target of 2,925. Market bears can cite reasons for lower prices including fears that the Federal Reserve will keep raising interest rates until the economy slows and even enters recession. Global growth is also slowing. This will affect the pace of earnings growth at a time when valuations are stretched to the high side. “The rate of earnings growth has certainly peaked as the surge in profits from the initial cut in tax rate was always going to be most pronounced in 2018. And glamour ‘one decision’ stocks often disappoint investors when the lofty growth rates embedded in valuations turn out to be unachievable. But since the start of the second-quarter earnings season, the consensus forecast for 2019 tech sector EPS has actually increased by 1%.” However, that might not be enough. Vincent Deluard, global market strategist at INTL FCStone told MarketWatch, that “constituents of the S&P 500 index are on track to buyback 30% less in stock than they did in the second quarter, and he predicts the rate will continue to slow from here. That means the much heralded predictions that there will be $1 trillion in stock buybacks this year “won’t even come close” to being realized, Deluard estimates. Rising interest rates. Years of massive monetary stimulus meant that the dividend yield for many U.S. companies remained higher than the interest those companies had to pay on debt, making it sensible to issue new debt to buyback shares. That all ended when the Fed started raising interest rates, and “as a result investors are no longer rewarding companies for purchasing their own stock,” according to Deluard. That can be seen in the fact that “since the Federal Reserve began raising rates in December 16, 2015, the Invesco Buyback Achievers ETF has gained 28.09%, compared with a 33% gain for the S&P 500 index over the same period, according to FactSet. The end of this trend won’t be good for stock market valuations, said Deluard, but it will be good for American corporations, in the long run. He said close to one out of every three U.S. companies pay more in buybacks and dividends then they earn, a trend that cannot continue indefinitely. And, many companies, like International Business Machines Corp. have been forced to abandon buyback plans that have helped prop up valuations in recent years. Since 2013, the firm has repurchased $42 billion of its own stock at an average price of $175, Deluard said. On Tuesday, Big Blue announced a two-year suspension of its buyback program, to maintain it is a single-A credit rating. The stock is now below $120 a share. Repurchasing shares at such inflated levels may have provided a temporary boost to stock prices, but they destroy shareholder value in the end, is the popular criticism among those who decry buybacks. Deluard says that as the market weans itself off what has been a major source of higher support for shares, we shouldn’t expect stock valuations to surpass recent highs soon. This all points to the fact that investors should be cautious and should not believe that buy backs alone will push the stock market to new highs.